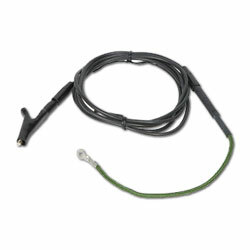 Simple-to-install ground wire assembly provides convenient operation when working on ground start circuits. Banana plug at end of cord permits extension to be removed when not required to help avoid tangled leads. Used with PE930, PE940, PE945, PE950 and PE960 telephone test sets.